CSX Transportation (reporting mark CSXT) operates a Class I railroad known as the CSX Railroad in the United States, owned by the CSX Corporation. The company is headquartered in Jacksonville, Florida, and owns approximately 22,000 route miles. CSX operates one of the three Class I railroads serving most of the East Coast, the other two being the Norfolk Southern Railway and Canadian Pacific Railway. This railroad also serves the Canadian provinces of Ontario and Quebec. From the company website: CSX Corporation is the parent company of several direct and indirect wholly-owned subsidiaries, including: CSX Intermodal, Inc.; CSX Real Property, Inc.; CSX Technology, Inc.; CSX Transportation, Inc.; Total Distribution Services, Inc. and TRANSFLO Corporation. Each subsidiary is a separate and distinct company. The railroad is known as CSX Railroad. As used on the company's website, "CSX," "CSXT," or "CSX Transportation" refers to CSX Transportation Inc., and "CSX Corp." or "CSX Corporation" refers to CSX Corporation. CSX Corporation authorizes use of the CSX service mark to CSX Transportation, Inc., and other CSX Corporation subsidiaries. CSX Transportation was formed on July 1, 1986 as a combining and renaming of the Seaboard System Railroad and Chessie System, Inc. into one entity. The originator of the Seaboard System was the former Seaboard Air Line Railroad, which previously merged Atlantic Coast Line Railroad, and later Louisville and Nashville Railroad, as well as several smaller subsidiaries. On August 31, 1987 the Chesapeake and Ohio Railway, which had absorbed the Baltimore and Ohio Railroad on April 30 of that year, merged into CSX. The merger had been started in 1980 with the merger of Chessie System and Seaboard Coast Line Industries to form the CSX Corporation. On June 23, 1997, CSX Transportation and Norfolk Southern filed a joint application with the Surface Transportation Board for authority to purchase, divide and operate the assets of the 11,000-mile Consolidated Rail Corporation (Conrail), which had been created in 1976 by bringing together several ailing Northeastern railway systems into a government-owned corporation. On June 6, 1998, the STB approved the CSX-NS application and set August 22, 1998, as the effective date of its decision. CSX acquired 42% of Conrail's assets, and NS received the remaining 58%. As a result of the transaction, CSX's rail operations grew to include some 3,800 miles of the Conrail system (predominantly lines that had belonged to the former New York Central Railroad). 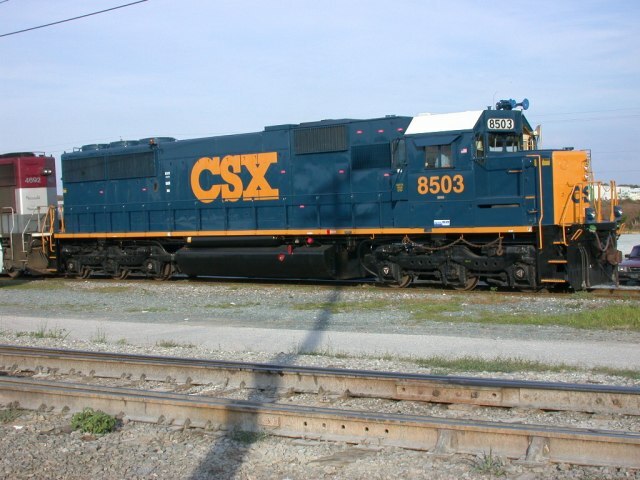 CSX began operating its trains on its portion of the Conrail network on June 1, 1999. CSX now serves much of the eastern U.S., with a few routes into nearby Canadian cities. The name came about during merger talks between Chessie System, Inc. and Seaboard System Railroad, Inc., commonly called Chessie and Seaboard. The company chairmen said it was important for the new name to include neither of those names due to its being a partnership. Employees were asked for suggestions, most of which consisted of combinations of the initials. At the same time a temporary shorthand name was needed for discussions with the Interstate Commerce Commission. CSC was chosen but belonged to a trucking company in Virginia. CSM (for Chessie-Seaboard Merger) was also taken. The lawyers decided to use CSX, and the name stuck. In the public announcement, it was said that "CSX is singularly appropriate. C can stand for Chessie, S for Seaboard, and X, the multiplication symbol, means that together we are so much more." The T had to be added to CSX when used as a reporting mark because reporting marks that end in X mean the car is owned by a leasing company or private car owner of some sort. CSX operates two regions: the Northern Region which is based out of Calumet City, Illinois and has five divisions, and the Southern Region based out of Jacksonville, Florida which also has five divisions. CSX rail tunnel at Harper's Ferry, in the Baltimore Division. CSX Transportation tracks in Clearwater, Florida, in the Jacksonville Division. CSX operates the Juice Train, train numbers Q740 and Q741, a notable unit train of Tropicana fresh orange juice between Bradenton, Florida, and distribution centers in the Greenville section of Jersey City, New Jersey and Cincinnati, Ohio in the United States. In the 21st century, CSX Juice Trains have been the focus of efficiency studies and have received awards. They are considered good examples of how modern rail transportation can compete successfully with trucking and other modes to carry perishable products. Coke Express trains run between Pittsburgh and Chicago, and other places in the rust belt, carrying Coke (fuel) to industries, mainly steel mills. CSX also runs daily trash trains out from New York City, bound for Florida, train numbers Q706/Q707 and Q702/Q703. These trains usually consist of about 50 cars with four 20 foot containers of trash on each. Another style of unit train is a local trash train, D765, runs between Derwood and Dickerson, both in Maryland. The train runs daily except Sunday, sometimes twice a day around holidays. Trash is carried from Montgomery County's Shady Grove Transfer Station to a waste-to-energy plant located off the PEPCO lead to Mirant's Dickerson Generating Station. The trip is roughly 17 miles (27 km), and the train is made up of National Steel Car Company-built well cars, hauling 40 foot containers. The first NEMX equipment was built when the D765 first started operations in 1997. In recent years, the fleet has been somewhat upgraded, repainted, and some entirely new cars have been constructed. In the early days, the locomotives powering the train were a GP40-2/RDMT slug set, but the train has since grown to roughly 40 cars. The locomotives that now routinely power the train are a pair of EMD SD50s. CSX, in cooperation with the Union Pacific, runs an extended haul perishables train, Q090; known by the railroad as the "Apple Train", from Wallula to Schenectady. This train typically runs with 3 UP AC44CW's and has its extended haul inspection from Wallula to Schenectady at Cleveland - Collinwood Yard on CSX headed in both directions, but on the return trip the train is labeled as a Q091. CSX Train Handling rule book is modified specially for this train to allow use of more power axles. Typical motive power in the form of a GE AC4400CW. CSXT SD40-2 8449, seen in Senatobia, Mississippi, on former IC rails pulling an auto train, is showing off the YN3 Paint, also known as the "dark future" paint scheme. C. S. Jackson Photo. A newer GE ES44DC in the CSX scheme crosses a diamond in Marion, Ohio. 2667 an EMD GP38-2, was the last unit left in Seaboard System paint. It has been since repainted into the YN3 scheme. 4617 is an EMD SD40 that was the last CSX locomotive still in C&O paint. It has been since repainted into the YN3 scheme, and has also become the last non "Dash-2" SD40 left on the CSX roster. 8886 is an EMD SD40-2, rebuilt by Conrail with a 16-cylinder engine and redesignated as an SD40-2, ex Conrail 6661, built as Erie Lackawanna SD45-2 3676, November 1972. 8889 is an EMD SD40-2, rebuilt by Conrail with a 16-cylinder engine and redesignated as an SD40-2, ex Conrail 6663, built as Erie Lackawanna SD45-2 3678, November 1972. 8954 is an EMD SD45-2, ex-Clinchfield; the last SD45-2 left on the CSX roster. It also still carries YN1 paint. Former CR locomotives can be spotted by recognizing phase differences in engine models and numbering. Other spotting details can be inconsistent, but can include a number of the following: Class lights, Leslie model RS3L air horns, former Conrail SD40-2s ride on Flexicoil "C" trucks and have anticlimbers, ditch lights mounted beneath the anticlimber, headlights above the cab (vs. CSX's standard practice of nose mounted headlights on all wide nose GE units), and modified "Bright Future" paint with battery box faces painted yellow versus black or blue. CSX has created a new paint scheme, known as YN3, which debuted in 2002 on EMD SD50 8503 , now downgraded to an SD50-2. Currently, CSX has over 1000 YN3-painted locomotives and are continuing to paint their locomotives in YN3. The vast majority of CSX locomotives today have flashing ditch lights. Many types of horns are used by CSX such as the Nathan K5H, K5LA, K5LLA, K5HL, K5HLL, and P3, and the RS3L and RS5T from Leslie. Road slugs are common in several switching applications on CSX. Many of these units are mostly converted from older locomotives. ^ Dolinger, Milt (2006-05-01). "How CSX got its name". Trains magazine online. http://www.trains.com/trn/default.aspx?c=a&id=274. ^ Air Brake and Train Handling Rules. Rule 5502-A-4: CSX Transportation. October 2007. pp. Section 4, Page 1. ^ "Runaway train stopped". http://archives.cnn.com/2001/US/05/15/runaway.train.05/. Retrieved 2008-02-25. ^ "Rail workers describe how they stopped runaway train". http://archives.cnn.com/2001/US/05/16/runaway.train/. Retrieved 2008-02-25. ^ "CSXT locomotive 8888 gets into trouble again". http://www.utu.org/worksite/detail_news.cfm?ArticleID=5612. Retrieved 2008-02-25. ^ Trains Magazine (July 8, 2006). "North America's Hump Yards". http://www.trains.com/trn/default.aspx?c=a&id=537. Retrieved June 27 2008.